Le Donjon de rêves was a an exhibition held in 2012 at the Chateau de Vincennes (Paris). With a rich history linked to the royal power and more widely to the history of France, the Chateau de Vincennes have had several assignments throughout its life. This impressive fortress tower including a hight of more than fifty meters and a wall built by Charles V in the fourteenth century was a prison from the sixteenth century. As such, the tower have housed famous prisoners like Fouquet, Diderot, the Marquis de Sade and Mirabeau. 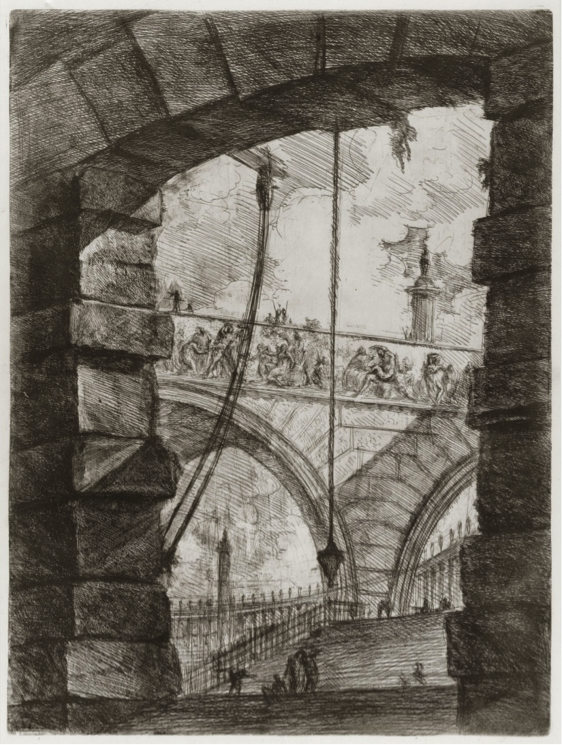 The recent donation of twelve engravings of Piranesi entitled “Imaginary Prisons” at Vincennes was an opportunity for the Centre of National Monuments to give carte blanche to the artist François Schuiten whose cartoons were strongly influenced by Piranesi. François Schuiten, through a dreamlike journey into the monument, will enable visitors to confront the reality of the dungeon and its artistic representations to consider how its architectural structure - well, drawbridge, endless staircase … - is embodied in the works of Piranesi and Schuiten. Three centuries later, François Schuiten confronts his vision of the tower to that of Piranesi and initiate a dialogue with his work. This meeting is not very surprising. In Volume III of “Obscure Cities” Schuiten did he not call the maintainer of the Tower Giovanni Batista? 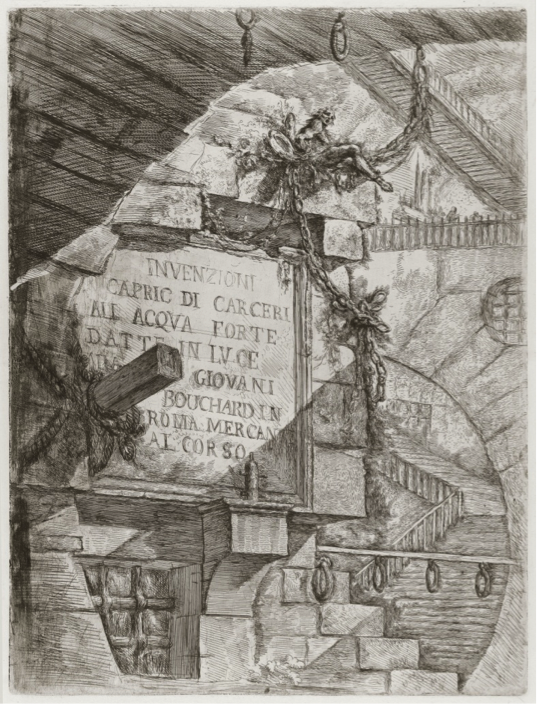 A name which is none other than … by Piranesi. This exhibition is presented under “Monuments and Imaginary,” curated by Christian Caujolle. 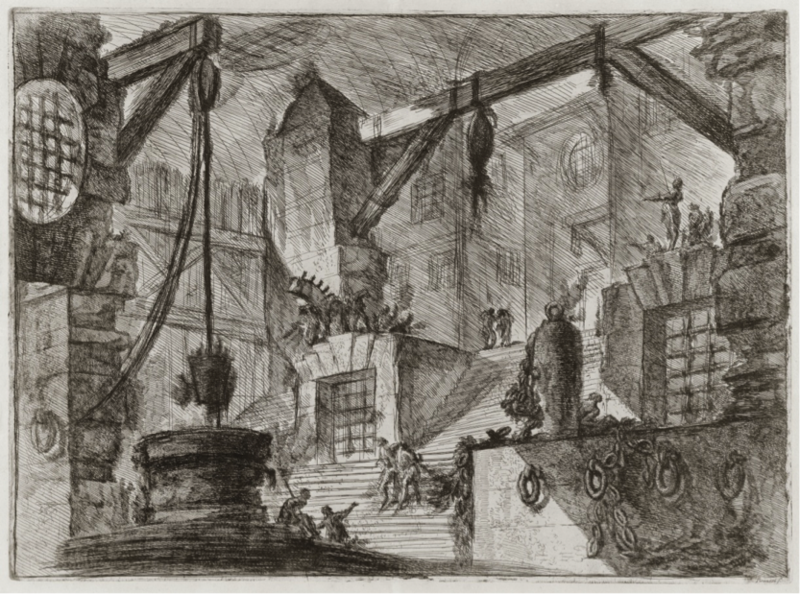 See the topic on Piranesi for more artwork. Outside Paris, the Chateau de Vincennes was the residence of the kings of France, before becoming the prison the Marquis de Sade, Diderot or Mirabeau. 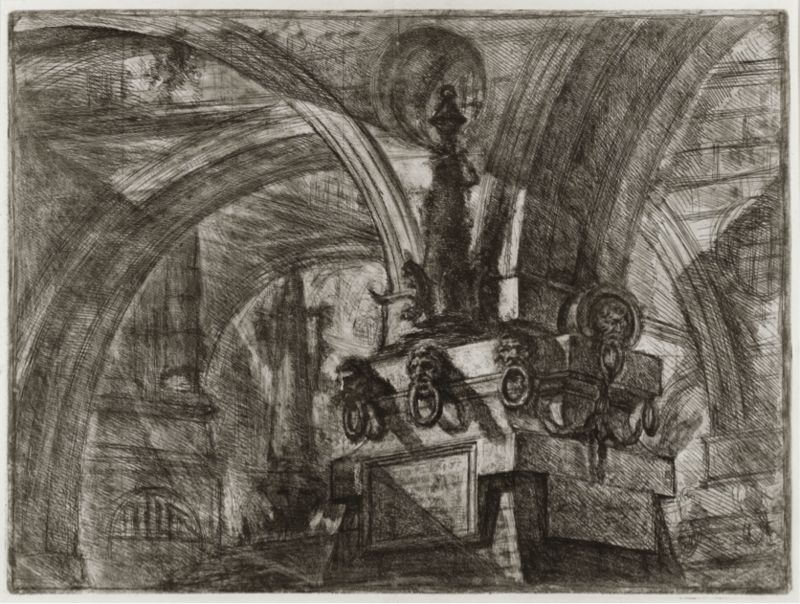 The Belgian cartoonist of the Obscure Cities, François Schuiten, was invited by the National Monuments of France to stage our fears and utopias in the dungeon of the fourteenth century, where his imagination meets that of the architect of crazy “Imaginary Prisons” , Piranesi, in the exposure of the Dungeon of Dreams . The artist talks about his trip to utopia in a web-interview at the foot of the castle tower 2). Arte interviewed François Schuiten on the project. Some extra information on the Obscure Cities is added to the interview. Any monument in the imagination is at work. Imaginaries intersect, combine and form the basis for the identity and every single time sites whose complexity or requiring fascinates. Serving convening authority or forces and beliefs, imaginations were essential to the design of monuments. Then others came to enrich the complex. Today, the audience brings their own desires, dreams, desires and appropriates the space that houses it. Throughout France, from March to October 2012, more than 30 monuments will present the extreme diversity of these imaginary with an open and eclectic cultural programming. Those who cohabit multiple approaches and different times. If completeness is impossible, a panorama of the widest possible modes of expression of these imaginary is presented: the architecture as well as sculpture, drawing as much as video, film, voice and sound, photography and artwork. All eyes today will talk - or confronting - with those who preceded them. With the hope that these views of various artists allow visitors to unleash his own visions, he claims his own imagination.